FRED is Shell's consequence modelling tool, available exclusively through Gexcon. 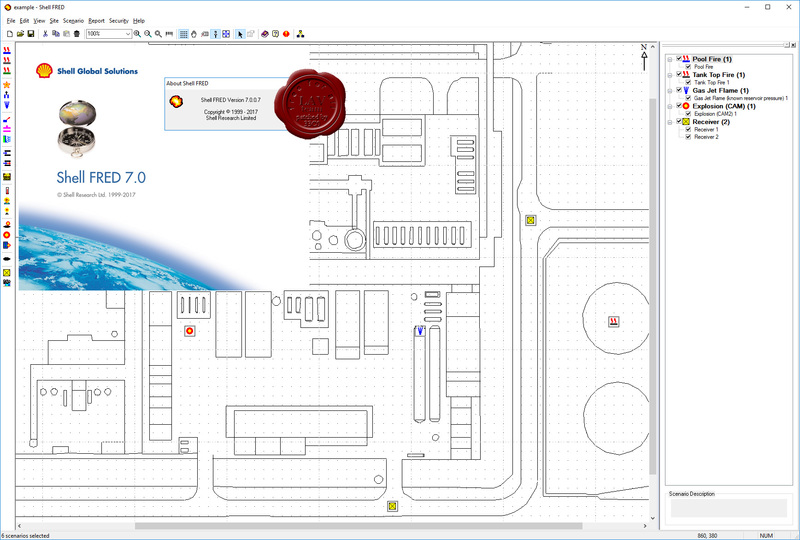 The FRED software gathers in one tool state-of-the-art Fire, Release, Explosion and Dispersion models that predict consequences of accidental and design releases of products from process, storage, transport and distribution operations. Its ease of use allows the user to rapidly comprehend the consequence prediction related to incidents for facilities and operations. It provides the user with an at-a-glance overview of the extent of blast waves, gas contours and heat radiation directly on site plan. FRED has been continuously developed and validated by Shell since the 1980s, and has been extensively used by oil, gas and petrochemical operating companies, engineering contractors, insurers and regulators throughout the world. The integrated models rely on an extensive and unique programme of large-scale experiments, combined with validated scientific research, that assure the reliability and consistency of the results. FLACS is the industry standard for CFD explosion modeling and one of the best validated tools for modeling flammable and toxic releases in the technical safety context. FLACS is a comprehensive, yet easy to use, software tool for modelling (dispersion and explosion) consequences in full 3D for all typical flammable and toxic release scenarios. It is used extensively in the Oil and Gas and Process industries and also increasingly in the nuclear industry, in facilities with dust explosion potential and many other fields. By modelling with CFD in full 3D it is possible to predict consequences much more accurately and to include the effect of all contributing and mitigating effects (such as confinement and congestion due to real geometry, ventilation, deluge). A better understanding and higher accuracy of results not only contributes to raising the true level of safety but also allows designers to choose truly effective design option and mitigation measures and thereby improving both safety and cost effectiveness way. Integrated explosion and dispersion modelling capabilities. Geometry import (Microstation dgn v7/8 format, PDMS(via dgn), PDS, AutoReagas). Efficient manual editing of geometry. Include effects of mitigation and preventive measures. Accurate and extensively validated results. Various different options for viewing results (2D, 3D, animations, text file output). A better understanding of the phenomena and results. Comprehensive user guidelines based on extensive validation against experiments. Offshore Explosion study (both risk based and deterministic). Onshore building risk assessments (i.e. control room or temporary buildings). Accident investigation (FLACS was used for investigating many different accidents such as Piper Alpha, Buncefield, Deep water Horizon, Texas City Refinery, TWA 800 aircraft accident).